Wimbledon are using social media as the tournament continues to experiment with new technology to extend the championships reach. There is extensive BBC interactive Wimbledon coverage and international audiences can buy an online video stream subscription through Wimbledon Live on the Wimbledon website. 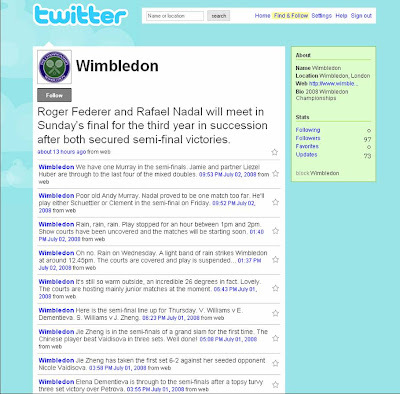 However, whilst the Wimbledon website gains high traffic (8.6 million unique visitors viewing over 266 million pages in 2007), Wimbledon are also extending coverage by using social networks and social media. The aim is to create opportunities for deeper engagement with the tournament and allow Wimbledon fans to discuss and share Wimbledon content. The Wimbledon Facebook Fan Page is a great example of how Facebook Fan Pages can be used. 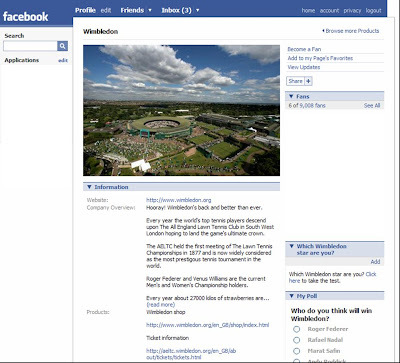 The Wimbledon Facebook Fan Page acts as a hub for all the Wimbledon online activity and gives Facebook users insight to the tournament. A wide range of photos and videos have been posted, official Wimbledon bloggers leave Facebook notes and updates, an MP3 player broadcasts Radio Wimbledon and Wimbledon fans have the chance to vote in Wimbledon Polls and opportunities to upload their own Wimbledon content. The Wimbledon Fan Page has over 9,000 fans. IBM provide the technology for Wimbledon and since 2006 IBM programmers have been bringing Wimbledon experiences into Second Life. For 2008 a mini-Wimbledon has been built with courts, various IBM behind the scenes info stands, links to live scores and free gifts / games. I also got given a Second Life Wimbledon T-shirt (which I am wearing in the picture below), though I would recommend familiarising yourself with how to change clothes before trying to put the T-shirt on - I ended up naked on the court for a good few minutes while I worked out how to change clothes! There are also supplemental areas such as the Wimbledon back office and a roof garden where you can drink free Pimms and eat more strawberries and cream. 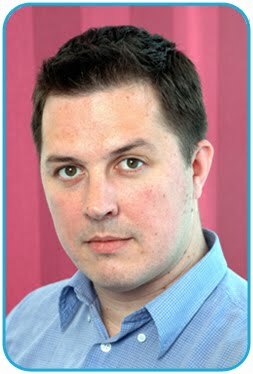 During the day the Wimbledon area is staffed by super-helpful IBM employees who can answer questions and guide you around. This really adds something to this environment and I enjoyed being able to engage on a personal level. Second Life Wimbledon is there until the end of the tournament, have a look before it goes! Wimbledon are running a Fanlog through the Wimbledon website and publishing Facebook notes on the Wimbledon Facebook Page. These posts aim to provide alternative viewpoints to the main media reporting by allowing both Fans and behind the scenes people to publish their thoughts. 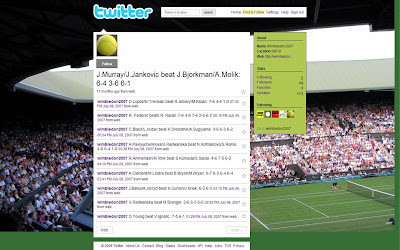 Wimbledon started using Twitter in 2007 (under the username Wimbledon2007) to publish scores and updates. Wimbledon continue to experiment with technology and the social media initiatives that are running around the tournament are interesting. It presents an intriguing blend of tradition (white kits etc) and modernity, but seems to work and successfully brings Wimbledon to life online. just a little correction to some numbers. Thank you for your comments. 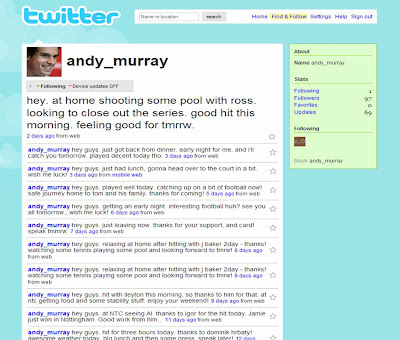 I have amended the section on Twitter so that it now shows the correct official Wimbledon Twitter. I'm a bit confused over page views though, as I got my figures from the Behind the scenes IT section of the Wimbledon website. Also wouldn't 266 billion views work out to be something like 30,000 page views per user???? Apology accepted! Would also be great to know the unique user and page view figures for the 2008 tournament. Do you know when these will be available please?